Chris Shiflett has his feet firmly planted in two worlds--with impeccable punk/hard rock credentials as longtime guitarist in the Foo Fighters, and with an authentic love for country, as heard in side project Chris Shiflett & the Dead Peasants. 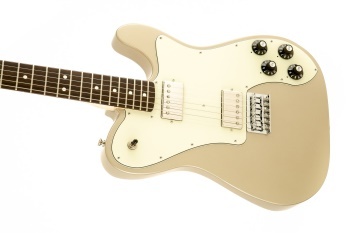 His abiding love for Telecasters and for huge humbucking sound now comes together in one powerful new instrument with his name on it-the Chris Shiflett Telecaster Deluxe. Eminently affordable and modeled closely on Shiflett's favorite '72 Tele Deluxe, it features a roaring pair of new custom-designed high-output humbucking pickups, a 12"-radius rosewood fingerboard for easy bends with low action, custom-stenciled hard-shell case, and Shiflett's signature on the headstock. Tour bus, platinum records and the adulation of millions not included.